I read a number of interesting comments posted by folks who attended this event. Some had a great time; others a terrible time. I understand some of the frustration since I’ve had many of the same concerns over the years. Many concerns could have been mitigated by visiting the Mobile Food Rodeo website. They provide tips and ALWAYS list their truck lineup. Yes, it’s busy. Because everyone has the same idea – eat yummy food! 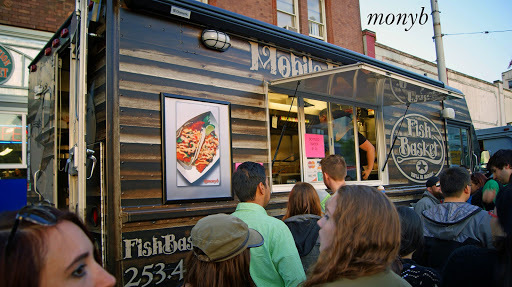 My mantra is the same for each huge food truck event. If you want to see as many trucks as possible, get there early before the lines. I was there at 5pm and the lines were minimal. Otherwise, get there whenever you want and come with friends. If there’s 6 of you and each of you stand in a line to buy food to share, that’s only one time you have to wait in line. If each person gets 2-3 dishes (12-18 dishes total), all of you will have plenty to eat. For most of the trucks, I’m in line with everyone else. I typically don’t see trucks that I have access to on a regular basis and focus on newer trucks and those with interesting menus. It’s hard to spread the love around with the sheer volume of mobile trucks in Seattle. 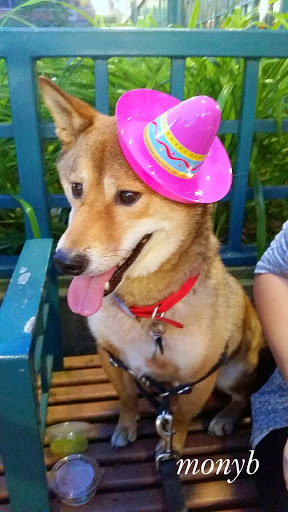 Are dogs welcome? I’m not sure but there’s always a good amount of well-behaved, leashed friends. This is my current crush Sawyer. Isn’t he adorable? Now on to the trucks! Meat on a Mission is a truck I haven’t visited before. 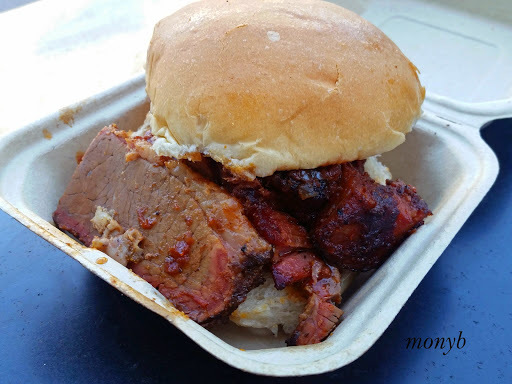 I decided to stop by for a brisket sandwich. I love brisket! I prefer my brisket sliced (and they give you a choice). The slices were a decent size and the portion was good for the price. It was fragrant with smoke and the sauce was flavorful. The brisket was slightly underdone and not as tender as I would expect. The bun was sweet and easy to grab…for a little while. By the time I got to the last 1/4 of my sandwich, the bottom of the bun was a soggy, gooey mess. The presentation was messy, including the box that was covered with sauce on the outside. Al’s Gourmet Sausage totally blew my mind! Now, there was a shave ice vendor on site. When I stopped there, they were actually selling snow cones. 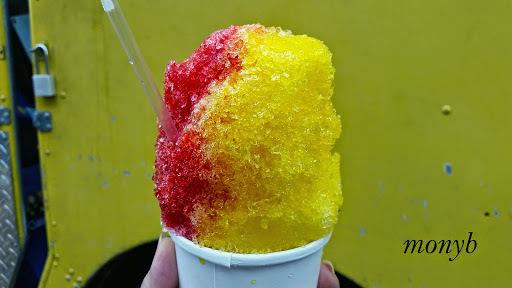 Shave ice and snow cones are not the same thing. I was bummed, wandering aimlessly. I came across Al’s and they had a shave ice machine! They even had syrups imported from Hawaii! Al’s is totally legit in my book. Fish Basket was in the house with their cod tacos. The fish was crispy as ever! 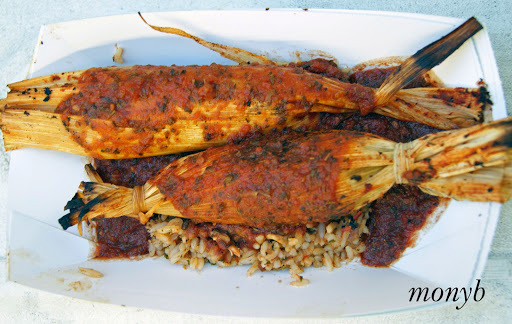 The flavors of the fish, sauce, and fresh veggies will make you want more! Okay, I was starting to get full but remember, I’m in it to win it!!! Bread and Circuses was a hit! They ran out of their savory tacos early that night. 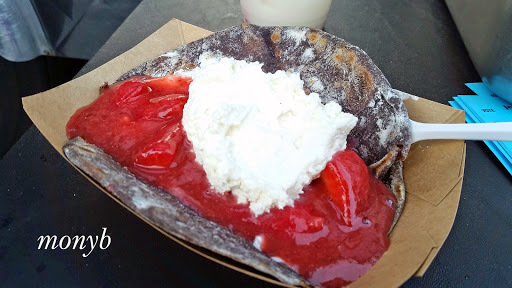 They did have a few sweet tacos left – chocolate tortilla, macerated strawberries and whipped cream. Thank goodness I found them. It had been a whole 15 minutes since the last time I ate! 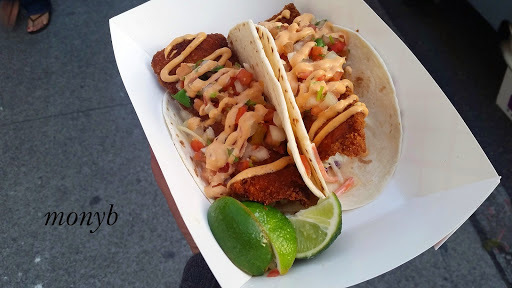 Jemil’s Big Easy was on the street with two specials – beef tamales and cajun tacos. The biggest thing about Jemil’s food is the flavor and spice. The tamale sauce had just the right amount of heat. 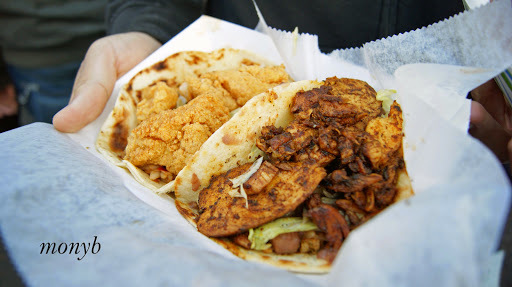 The cajun tacos featured a fried and not-so-fried option for those who think they’re going to eat healthier, lol. 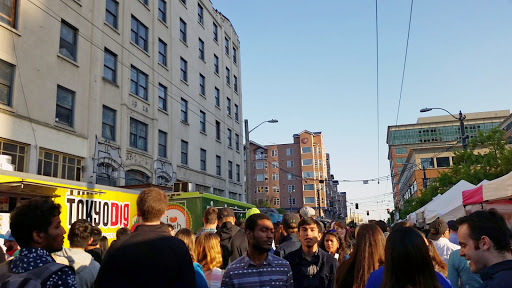 Honestly, I wanted to hit up more trucks but a combination of lines, growing fullness in my belly, and exhaustion of hitting up two major food truck events on the same day set in. Overall, the event was pretty successful. The “All-You-Can-Eat” Taco Bar lounge was presented by The Matador. For $25, people were promised as many tacos as they could fit in their bellies. I didn’t participate (mostly since I’m not a huge fan of food from The Matador) so I won’t write from personal experience. Suffice to say, it seems that it could have been a more positive experience for folks. Find me here: Twitter / Instagram / Flickr for more food truckery!